Is there any such material as plain carbon steel? Is so, what is it, what’s its chemical composition, and which applications are best-suited for its use? Low-carbon Steel Expansion Joint for Power Plant; Small Amount of Copper Added to Enhance Corrosion Resistance. Those of us in the welding and job shop industry have seen and heard the term just plain carbon steel many times. Is there really any such thing as plain carbon steel? A term used often in the past to describe plain carbon steel is mild steel, a metallurgical descriptor that defines the material’s capability for end use. You must study several specifications to determine if a metal is fit for its intended use. In most cases, the egg comes before the hen. Engineers establish requirements for the end use and then seek the proper material to achieve the desired result. For A36/SA36 material, the tensile and yield strength are moderate. The yield is approximately 36,000 PSI, and the tensile strength varies from 58,000 PSI to 80,000 PSI. Variations in tensile strength allow for the difference in carbon, manganese, and silicon content in different thickness. Also the production method—rolling, hot or cold, or extruding—can affect tensile strength. Additional carbon and manganese produce a higher strength but lower ductility. For example, the minimum elongation in 2-inch plate is 23 percent, and for shapes, 21 percent. If wear resistance is required, then A36/SA36 is not a good choice. Wear resistance is related to hardness and hardenability. It is common to say that a metal containing less than 0.30 percent carbon is not readily hardenable, although it may be case-hardened in an atmospheric carbon-enhanced furnace. If corrosion resistance is a must, A36/SA36 is not a good choice. This material does not contain the elements, such as copper, chromium, or nickel, which produce corrosion resistance. In the past this material was available in a pickled and oiled form condition that was slightly more corrosion-resistant. Ductility and form-ability are directly related. These properties are determined by tests for tensile, yield, elongation (how much the material will stretch before failure), and reduction (shrinkage in cross-sectional area before failure). 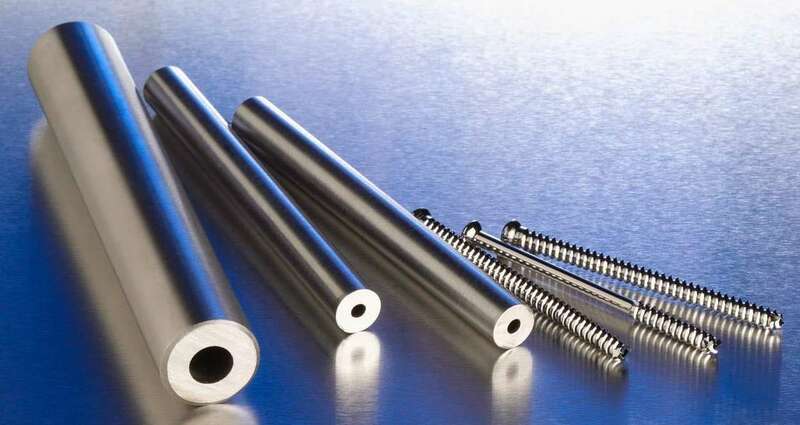 If the material is to be bent or rolled, ductility is very important, and A36/SA36 is a good choice. A 90-degree bend is not at all uncommon for this material. It also can be rolled easily and has practically no springback (opening up after rolling). Some relatively new specifications relating to ASTM A36 material are available. The ASTM A1011 Grade 36 and ASTM A1018 Grade 36 specifications are for the sheet and strip forms of A36. The A709 Grade 36 is denoted as bridge material with the same basic chemical, mechanical, and physical properties. Carbon adds to strength and hardenability of steel. A36/SA36 is less than 0.30 percent carbon and will not harden appreciably. The rule of thumb is that 0.30 percent is the lower limit for quench and temper through hardening. Manganese contributes to work hardening in an iron matrix. Work hardening is also used to increase tensile strength. Manganese usually is alloyed in A36/SA36 at 1 percent to 1.60 percent. Phosphorus is not considered a beneficial element in most cases. While this chemical can increase harden-ability, any amount over about 0.04 percent may cause embitterment. Sulfur is detrimental for welding but enhances machinability. Materials sometimes are treated in a sulfur atmosphere if they are to be machined. In some cases, sulfur combines with manganese (creating manganese sulfides) to cause lamellar inclusions, which promote laminations or lamellar tearing. Sulfur is normally limited to 0.05 percent or less. Silicon, a metalloid, is an excellent deoxidizer and scavenger for floating out contaminants. It is also very valuable for increasing hardenability. Copper is added to some low-carbon steels for atmospheric corrosion resistance. It is used predominantly at 0.20 percent to 0.40 percent for high-strength, low-alloy materials and weathering steels. Iron is abundantly available and an extremely valuable material. The greatest advantage of iron is that it may be alloyed for various usages. The alloying elements noted previously may be used to transform the melting point (about 2,780 degrees F), the tensile strength, formability, and, ultimately, the end use of the material. Perhaps black iron is a good slang term for A36/SA36 material. Consider the math for the chemistry for 1-in.-thick A36/SA36 plate: Carbon (0.25%) + Manganese (1.00%) + Phosphorus (0.04%) + Sulfur (0.05%) + Silicon (0.40%) = 1.74% total alloys other than iron. 100% – 1.74% = 98.26%. The 98.26% represents the balance of the chemistry, which is Iron. This is what most call just plain low-carbon steel!